Additional information: Son of Elizabeth Valentine. Grave/Memorial Reference: VI. D. 37. Other: 6th Bn. formerly TR/1/9312 40th T.R. Bn. The third of the war graves in the old churchyard is soon to have a headstone, the casualty was another "non-comm" until not so long ago. 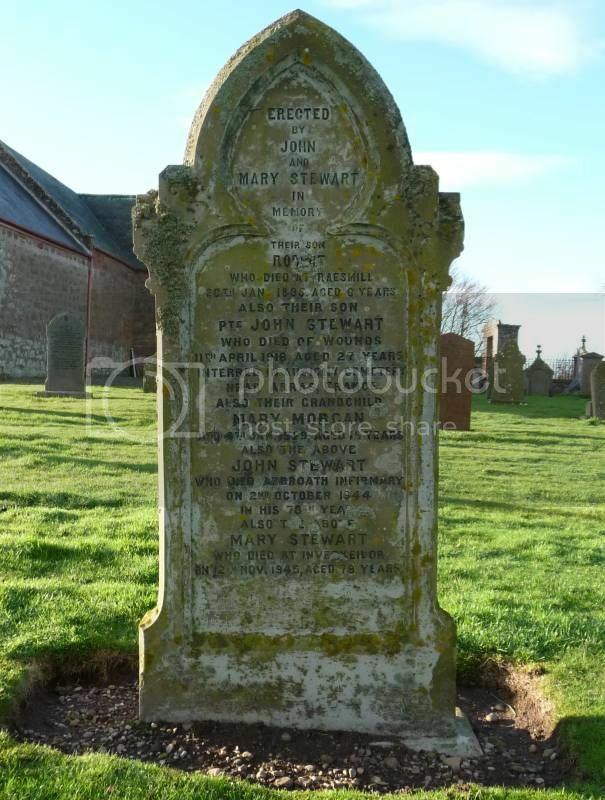 Additional Information: Son of James and Mary Ann Orrock, of Inverkeilor, Arbroath. I did the research on this one for the CWGC and found a relative who OK'd the commemorative headstone. I'm really glad that he will now be commemorated - will you post when the headstone is in place? I will be up in the area in August and would love to visit the churchyard. Grave Reference: III. B. 25. Additional Information: Son of John and Mary Stewart, of Anniston Lodge, Arbroath, Forfarshire, Scotland.